Digital transformation isn’t a quick or easy process. At NCVO we’re making a start by building the digital skills and confidence of our staff. Over the last 18 months, I’ve been planning, designing and running the Learning Lab – an internal digital skills programme for NCVO staff. 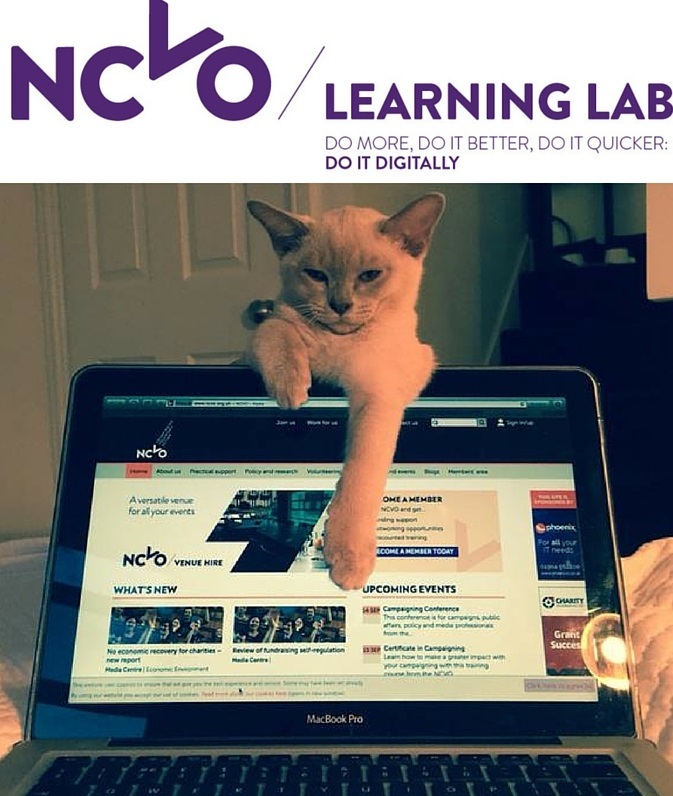 The Learning Lab was created in response to NCVO’s five year strategic plan, launched in 2014. With a focus on digital, the strategy set out ambitions to increase collaboration and engagement with our members and other audiences. Like many organisations we’re trying to shift digital expertise across teams. However it isn’t as simple as redistributing the digital team. We developed the Learning Lab to help drive this change, so staff are not only equipped with the skills to use digital more effectively and efficiently, but feel confident to apply these skills. We started off by researching digital literacies, planning and designing the programme. We created our own digital skills framework which identified the behaviours and skills we thought people at NCVO needed in order for us to become a more digitally mature organisation. We identified risks and created a plan for how they could be managed, then conducted an all-staff survey to identify current skills gaps, confidence levels and attitudes toward digital. The Learning Lab offers 16 different sessions, covering a range of digital tools and approaches including agile project management, using images online, writing for the web, curating content and running online events. Content is tailored to NCVO’s work and strategic aims and all sessions have practical elements where attendees are encouraged to share experiences, challenges and expertise. Images of cats using computers feature heavily in session content and internal comms because who doesn’t love a cat photo? While we considered both an e-learning platform and inviting external specialists to deliver more formal training, we settled on a peer to peer approach, asking members of the digital and communications team to design and deliver sessions. We wanted to utilise the talent and knowledge of staff at NCVO and offer them the opportunity to develop their skills and confidence further. This also allowed us to really tailor the programme to meet the needs of NCVO’s structure, culture and strategy. Attendees receive a badge after each session and when they’ve collected six or more badges, they’re added to a leaderboard, which creates a bit of friendly competition. And because our initial survey indicated the different learning styles across the organisation, we’ve curated a library of resources staff can browse after a session. The biggest challenge has been maintaining engagement, particularly when people are particularly busy. Keeping sessions to one hour has definitely helped and we try to be as flexible as possible in terms of when we run sessions. Managing the logistics is fairly time intensive. I’ve been fortunate that a large part of my role at NCVO has focused on designing and running the Learning Lab. I know many organisations won't have a dedicated person to spend a lot of time on this, which is why I created this toolkit. I wanted to share my work to save others having to start from scratch. As we approach our 100th session, we’ve started to see a shift in the way people approach digital. 70% of current staff have attended one or more session, 97% have learned something new and after six months 85% could articulate at least one thing they’ve done differently. We’ve learnt a lot along the way, and I’m excited to share our approach in our new practical toolkit, Building a digital workforce – designed to help organisations plan, design and deliver their own digital skills development programme. We’ve already worked with Prostate Cancer UK to deliver two workshops to help get their digital skills programme off the ground. While they were already running some digital training, the workshops encouraged the project team to focus more on planning a structured programme that would align with the organisation’s strategy and culture. We had an idea we wanted to do something like this but didn’t know how we’d structure it or make it a cohesive programme. Helen’s help was invaluable in focusing our thoughts and, by sharing her experience and tools, she guided us in the right direction. We definitely couldn’t have got to where we have without her. I know more and more organisations are starting to think about upskilling staff but perhaps don’t have the resources to design a programme from scratch. This toolkit offers some great tips and templates that help organisations quickly structure a programme that suits them, saving them time and money. Visit NCVO Knowhow Nonprofit to download the free toolkit. Helen Ridgway is NCVO’s online engagement manager. Helen has worked in the charity sector since 2006, including roles at NUS, St Mungo’s and Muscular Dystrophy UK.